The cells of our bodies are in constant flux. The outer layers of our skin are replaced every few weeks. The epidermis is made of several distinct cell layers. These tissues undergo continual rejuvenation through homeostasis, and, in addition, they must be primed to undergo wound repair in response to injury. Stem cells in the epidermis have a crucial role in maintaining tissue homeostasis by providing new cells to replace those that are constantly lost during tissue turnover or following injury. Stem cells are the ‘master cells’ of the body, with the remarkable capacity to become many different cell types. In healthy individuals, skin integrity is maintained by epidermal stem cells which self-renew and generate daughter cells that undergo terminal differentiation. These stem cells lose the ability to regenerate as we age and allow the skin to become wrinkled and lose its elasticity. They sit in the lowest layer of the skin but don’t constantly divide to make new cells. They can be called into action if the skin is damaged, or if the numbers of other types of more mature skin cells decrease. However, aging is accompanied by decreased tissue regeneration and homeostasis, both of which are frequently associated with impaired stem cell function. As some stem cell compartments undergo dramatic age-associated changes, a decline in stem cell function is suggested to contribute to the aging process. This explains why older skin is slower to heal and in part why our skin changes as we age. Despite accumulation of senescence markers in aged skin, epidermal stem cells are maintained at normal levels throughout life. Therefore, skin ageing is induced by impaired stem cell function or reduced number of stem cells that are able to respond to proliferative signals. It means the skin has a population of ‘sleeping’ stem cells, which sit in the lowest layer of the skin but they didn’t divide at all and didn’t contribute to forming new skin cells. Preventing this process could be key to everlasting youth. And it might be possible to turn on the skin’s own resources to regenerate new skin cells, without the need for transplanting outside epidermal tissue or stem cells. This means that even an old person still has the potential to grow new young skin, but because of lack of some regulatory factors ‘sleeping’ stem cells can’t start replicating. As we grow older, we lose the ability to trigger these ‘master cells’ to kick into action and regenerate new young skin. They are held in a ‘sleeping’ state—one in which they don’t reproduce until they receive right set of signals from their surroundings that it’s time to regenerate. When they get the chemical signals, these self-renewing cells divide. Thus, the secret to the fountain of youth lies in awakening ‘sleeping’ stem cells in the skin. But what we do know, and have known for nearly half a century, is that stem cells are crucial players. Despite progress in understanding the potential of these multipotent cells, the unfortunate reality is that we remain far from cures. One possible reason for this is scientists’ failure to sufficiently consider what goes on within the biological environment surrounding the stem cell. For years, stem cell biologists have focused their attention on the intrinsic properties of stem cells to understand what gives them the ability to self-renew and differentiate into a range of cell types. While these investigations have uncovered a collection of genes and proteins responsible for a cell’s “stemness,” the role of the microenvironment, also known as the stem cell niche, was largely ignored. Molecules that influence fate determination of stem cells are secreted from niche cells. The aging process affects not only the stem cells but also their microenvironment. The deregulation of local signaling pathways and accumulation of stress-induced damage, including reactive oxygen species (ROS), have been indicated as major causes of stem cell and niche loss of function during aging. Old niches appear to constitutively maintain damage response pathways and mechanisms, which younger niches activate only temporarily in response to injury. In this sense, niche aging might be perceived as a progressive switch from the ability to flexibly respond to damage to a constant repair mode, which eventually exhaust the stem cell regenerative potential. In addition to niche-specific cells, stem cells regularly interact with the immune cells. Traditionally regarded as the primary line of defense against pathogenic invaders, the immune system is now also recognized as essential for tissue homeostasis and healing, even in the absence of infection. Research is now showing that the immune cells residing within the stem cell niche are essential for maintaining homeostasis and function properly. Human aging is characterized by a chronic, low-grade inflammation, and this phenomenon has been termed as “inflammaging.” Inflammation can be beneficial as an acute, transient immune response to harmful conditions such as traumatic tissue injury or an invading pathogen. Chronic inflammation has many features of acute inflammation but is usually of low grade and persistent, resulting in responses that lead to tissue degeneration. This inflammatory state can modulate a variety of immune functions and contribute to the increased susceptibility of the elderly to numerous infection diseases. Many aged tissues are in a chronically inflamed state. Studies suggest that the age-associated increase in macrophage PGE2 production is due to ceramide-induced up-regulation of nuclear factor-κappa B (NF-kB) activation. NF-kB is the master regulator of inflammation. Chronic activation of NF-kB induces senescence and is importantly involved in age-associated muscle loss (sarcopenia). Increased NF-κB activation inhibits epidermal stem cell function. Stem cells also have their own drawbacks including epigenetic memory. Aging is accompanied with alterations in chromatin states triggered by changes in DNA methylation. Methylation can affect how genes are used. So a change in methylation might cause a change in how someone’s genes are used. If you think about the DNA strand as “hardware” and the added methyl groups as ”software”—which isn’t actually a bad analogy—you can think of the inappropriately placed methyl groups as software bugs that accumulate with age. Clearly, epigenetic changes are both responsive to and effectors of the aging process. With DNA damage and environmental stresses like inflammation leading to changes in chromatin, the epigenome clearly adapts to age-related changes in the genome and the local milieu. Perhaps the epigenome is a general sensor of cellular dysfunction, sensing metabolic and proteomic changes that accompany aging as well. Epigenetic reprogramming refers to changes in the stable transcriptional profile of a cell and changes in the very nature of that cell without changes in DNA sequences. Chromatin states can be erased if the modifications on DNA and histones that define them are altered. Epigenetic modifications such as histone acetylation and DNA methylation play a paramount role in regulating gene expression and exhibit unique changes during aging and age-related disease. It is quite clear that the reprogramming reverses many aspects of aging. 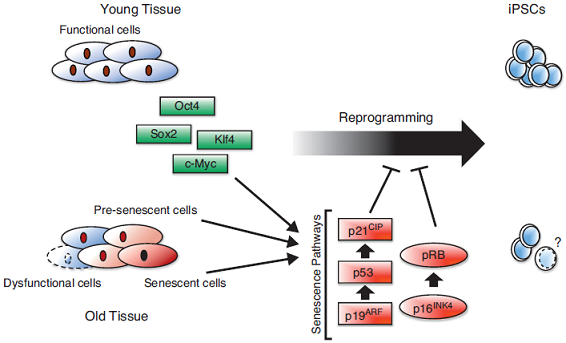 The aging signature: a hallmark of induced pluripotent stem cells? Stem cell aging: mechanisms, regulators and therapeutic opportunities. Aging and immune function: molecular mechanisms to interventions. Chronic inflammation (inflammaging) and its potential contribution to age-associated diseases. NF-kappaB signaling in the aging process. NF-κB in Aging and Disease. NF-κB in the regulation of epithelial homeostasis and inflammation. NF-κB inhibition delays DNA damage-induced senescence and aging in mice. Protecting skin photoaging by NF-kappaB inhibitor. Pharmacologic inhibition of JAK-STAT signaling promotes hair growth. p53 homologue, p51/p63, maintains the immaturity of keratinocyte stem cells by inhibiting Notch1 activity. p63 regulates human keratinocyte proliferation via MYC-regulated gene network and differentiation commitment through cell adhesion-related gene network. Notch signaling is a direct determinant of keratinocyte growth arrest and entry into differentiation. Role of Notch signaling in regulating innate immunity and inflammation in health and disease. Epiprofin orchestrates epidermal keratinocyte proliferation and differentiation. A dynamic model of keratinocyte stem cell renewal and differentiation: role of the p21WAF1/Cip1 and Notch1 signaling pathways. Age-related variations in the methylome associated with gene expression in human monocytes and T cells. Aging and reprogramming: a two-way street. Epigenetic regulation of ageing: linking environmental inputs to genomic stability. Aging, rejuvenation, and epigenetic reprogramming: resetting the aging clock. But today, new advances in cell biology make it possible for you to reprogram the aging process and keep your DNA younger. You can essentially rejuvenate every single cell in your skin and slow the aging process. Then, how could it be possible to stimulate “good” stem cells in the epidermis whilst keeping mutant stem cells latent? Our lab has successfully developed a simple solution Recellzym™ in order to modulate chronic low grade inflammation (inflammaging) and immune responses in the skin and reset stress-induced loss of epigenetic memory in aged stem cells and reprogram aging process. It’s one of the greatest discoveries of our time, and probably the most advanced anti-aging science breakthrough in this century. We have begun to test the potential of different interventions to restore youthfulness to aged cells or tissues. The following are three examples of apparently rejuvenating interventions—one epidermal stem-cell environmental, one epigenetic, and one pharmacologic—that result in apparently more youthful states of aged cells that retain their differentiated states. Recellzym™ has been proven extremely efficient and it possess great potential for achieving remarkable results on any skin type and any skin problems. It can naturally reverse the signs of aging and diminishes fine lines and wrinkles, smooths your skin, fades scars, decreases pore size, diminishes dark spots and age spots, and eliminates darkened cells. It is also clinically proven Recellzym™ is the most effective treatment for atopic and contact dermatitis (eczema), hives (urticaria), skin allergy, psoriasis, alopecia areata and skin pigmentation disorders. It can also stimulate eyebrow growth in just 30 days just as well as it stimulates hair growth in both males and females with hair loss. If you’re interested in transforming your life and taking control of your aging process, don’t hesitate to test Recellzym™ on your own. Recellzym™ is a topical skincare product you can apply to your skin after cleansing. You will be pleasantly surprised and you’ll find that you’re able to control more of the aging process than you ever imagined.